The Aster 30 SAMP/T is a land-based air defence system effective against high-speed threats such as tactical ballistic missiles, cruise missiles, combat aircraft and UCAVs. The Aster 30 SAMP/T is on order for the French Army and Air Force and for the Italian Army. A SAMP/T battery includes: command and control vehicle, Arabel radar and up to six Transporter Erector Launcher (TEL) vehicles, each with eight missiles and a store of reload missiles. The maximum speed of Aster 30 is 1.4km/sec. It can intercept targets at altitudes from 50m to 20km. The maximum range of the Aster 30 is 100km. A successful qualification trial in July 2005. The trial included target acquisition and tracking by the Arabel radar and interception of a C-22 target at an altitude of 7,000m and range of 26km. 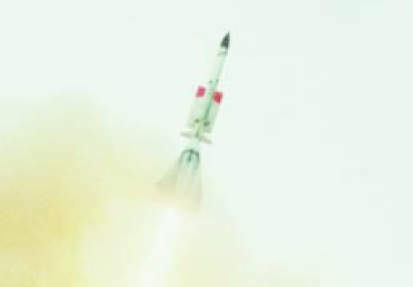 As the missile approaches the target in the terminal phase, it uses an active pulse Doppler radar seeker, which incorporates a high-power travelling wave tube transmitter and wide antenna deflection, to home in on the target. The Aster 30 SAMP/T system is highly automated – it can fire eight missiles in ten seconds from each launcher, engage up to ten targets simultaneously and can be operated by two people. The Aster 30 SAMP/T (sol-air moyenne portée terrestre or surface-to-air medium range / land) is a land-based air defence system effective against high-speed threats such as tactical ballistic missiles, cruise missiles, combat aircraft and UCAVs (unmanned combat air vehicles). The missile system has been developed by Eurosam, jointly owned by MBDA Missile Systems and Thales. The French Ministry of Defence has placed orders for six SAMP/T systems for the French Army and six systems for the French Air Force. Eurosam has received an order for six SAMP/T systems for the Italian Army. 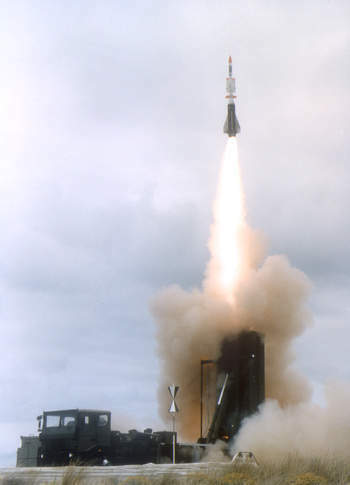 Full-scale development of the Aster 30 missile and the SAMP/T started in 1990, with production engineering and initial volume production in 1997. Qualification firing trials began in 1999. The first qualification trial involving the whole system took place in July 2005. The successful trial included target acquisition and tracking by the Arabel radar and interception of a C-22 target at an altitude of 7,000m and range of 26km. A second successful test took place in December 2005. The third and final test took place in November 2006 and involved interception of the target at altitude 3,000m and range 11km. SAMP/T began operational evaluation with the French and Italian armies in May 2008 with two successful test firings. "The Aster 30 SAMP/T (sol-air moyenne portée) is a land-based air defence system." Operational acceptance tests were concluded with the Italian Army and French Air Force in July 2008. In December 2008, a successful firing test took place, incorporating software changes suggested by the technical evaluation, prior to the delivery of the first serial production system to the French Air Force. SAMP/T systems in French service were operational by 2010. 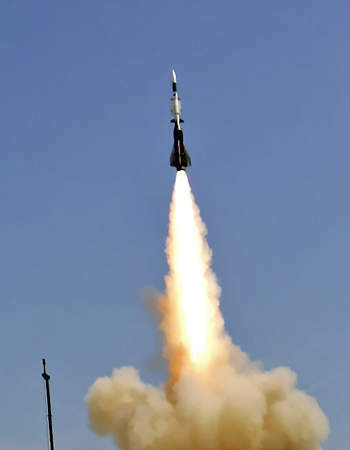 The SAMP/T intercepted its first ballistic target at the DGA missile launch test centre (CELM) in Biscarosse in October 2010. The missile systems are now in series production and being offered for the export market. MBDA is developing the ASTER block 2 missile for the SAMP/T launcher, which will have longer range and, with different trajectories, will be effective against future ballistic missile threats. A typical SAMP/T battery includes a command and control vehicle, Arabel radar and up to six transporter erector launcher (TEL) vehicles, each with eight missiles and a store of reload missiles. The missile TEL vehicles are dispersed to launch sites located up to 10km from the Arabel radar. The SAMP/T system uses MAGICS (modular architecture for graphics and image console systems) and MARA (modular architecture for real-time applications) computers. The Arabel multi-function radar acquires and tracks the targets. The command system evaluates, prioritises and designates the targets. The data on primary and secondary targets is downloaded to the missile launchers and seeker and data link frequency channels are allocated. The missile is launched and as it turns over in flight towards the target, the target’s position and velocity data are transmitted via the uplink channel at one second intervals. The SAMP/T uses an upgraded version of the Arabel radar, with improved performance developed under the Aster 30 block 1 upgrade program, in order to extend the system’s capability against higher speed targets and higher altitude targets. The SAMP/T system can intercept at 600km range (short range ballistic missile targets). The Thales Arabel radar is a 3D phased array radar for surveillance, tracking and missile guidance. The rectangular, 4,000-element, phased array antenna rotates at one revolution a second. Arabel operates in the eight to 13GHz X band (I/J band) with 360° azimuthal and -5° to 90° elevation scanning. The system can track up to 100 targets simultaneously and manage the uplink transmission of command update data to 16 missiles simultaneously. The standard Arabel radar operates at 150kW peak power and has a range of 100km. The beam can be shaped to optimise the performance. The radar uses frequency agility and pulse compression ECCM (electronic counter-countermeasures) techniques. "The successful Aster SAMP/T trial included target acquisition and tracking by the Arabel radar." For the French Army, the SAMP/T is mounted on a Renault 8×4 Kerax transporter erector launcher vehicle or a similar vehicle. Each vehicle is fitted with eight ready-to-fire missile containers and all eight missiles from a single launcher can be salvo-fired in under ten seconds. The SAMP/T for the Italian Army will be mounted on Astra 8×8 transporter erector launcher trucks, each truck with eight missiles. 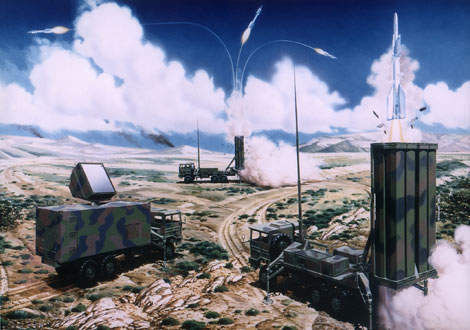 SAMP/T uses Aster 30 block 1 missiles which are equipped with a modified seeker, fuse, signal processing and a directional blast warhead where larger warhead fragments are directed towards the target. 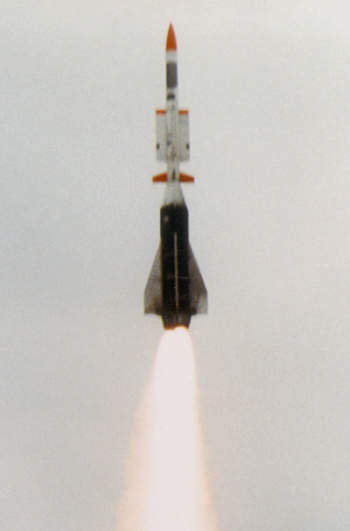 The Aster 30 missile has a tandem first stage solid propellant booster motor which is jettisoned after launch and turn-over and before the mid-course phase. The first stage booster motor, developed by Fiat Avio, has length 2.3m, weight 340kg, burn time 3.5 seconds. It has two steerable nozzles to provide the missile with thrust vector control during the initial stage of flight. After jettisoning the first stage booster motor, the second stage missile has a weight of 110kg, length of 2.6m and diameter of 18cm. The body of the missile carries four long rectangular wings and four blunt-tipped triangular control fins at the rear. The second stage missile is fitted with solid propellant sustainer motor. The sustainer motor efflux tube carries the uplink receiver and the fin actuators. The missile uses inertial mid-course guidance, with guidance correction update data being transmitted from the ground-based fire control centre via the Arabel multifunction radar’s uplink data channel. The Sagem Agyle inertial guidance unit is fitted with a Sistemi Inersiali inertial guidance reference system and a Sagem miniature laser gyroscope. The missile uses ‘pilotage en force’ (PIF) fine-controlled side thrust exhaust for manoeuvrability in the final phase of flight just before intercept, to ensure that the missile is within 2m of the target when the warhead is detonated. 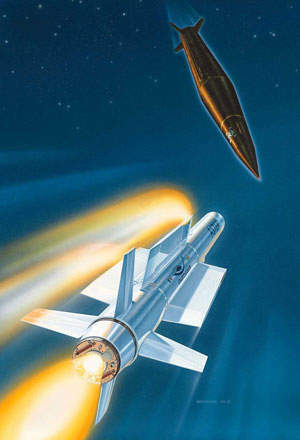 The missile’s PIF system comprises a solid propellant gas generator which exhausts through four lateral nozzles in the long rectangular wings at a point close to the missile’s centre of gravity. The missile does not role in the final phase of flight. The guidance control system commands the PIF system to exhaust through one or two nozzles generating a controlled sideways thrust pulling up to 60g acceleration. The missile and the target approach each other on a reciprocal flight path. As the missile approaches the target in the terminal phase, the missile uses an active pulse Doppler radar seeker, a derivative of the AD4 seeker design which incorporates a high-power travelling wave tube transmitter and wide antenna deflection, to home in on the target. "Aster 30 SAMP/T has the capability to intercept targets at altitudes from 50m to 20km." The seeker is laid on the target using data transmitted via the ground to missile uplink. Once seeker lock-on has been conformed the missile operates autonomously. The modifications to the seeker include higher closing velocity capability, an adjustment to the duty cycle to increase the transmitted power, an additional high resolution range function, and modified target lock-on and tracking algorithms. The seeker has ECCM including home on jam and clutter suppression. The programmable J-band pulse Doppler AD4A radar seeker manufactured by Thales and Selex Sistemi Integrati, operates at 12GHz to 18GHz. The missile, which weighs typically 100kg at target intercept, is fitted with a 15kg directional blast fragmentation warhead designed by Fiat Avio and MBDA. The warhead is fitted with a Ku-band proximity fuse, which generates a constant working pseudo random phase digital coded waveform. The warhead is loaded with two types of fragments, 4g and larger fragments, which are directed towards the target. The maximum speed of Aster 30 is 1.4km/sec. Aster 30 has the capability to intercept targets at altitudes from 50m to 20km. Against aircraft targets flying at altitudes above 3km, the maximum range of the Aster 30 is 100km. At aircraft targets with altitudes below 3km, the range of Aster 30 is 50km.